A Swiss Chalet in Michigan, eating Indian with India.....Sleeping Bear who? Sleeping Bear Dunes, Shuss Mountain and St.Croix Falls Wisconsin is where my dye party celebrated the Solstice this summer. India Flint led a whimsical landskin quiltfelt workshop on an organic farm in Wisconsin. New friends, magic juice (post mordanting) and AMAZING Indian food highlighted the trip. You could find me, India and a tribe of women feasting on Mushroom Mutter at the Vegetarian in St. Croix Falls after a long day of stitching and dyeing. Yum! Someone give that restaurant 5 stars. We tried every dish and could only ooh and awe at this foodie haven. Hiking, felting and just girls having fun stitching around the proverbial fire was how we spent a week that flew by. Thank you everyone for sharing such wonder creative energy. After a quick refueling at home in San Diego I headed to Detroit, Michigan to visit family, raided the antique and thrift stores then drove up north to Shuss Mountain. Visiting m friend and fellow Artisan Janet Crowe Whom I met at India's workshop last year. 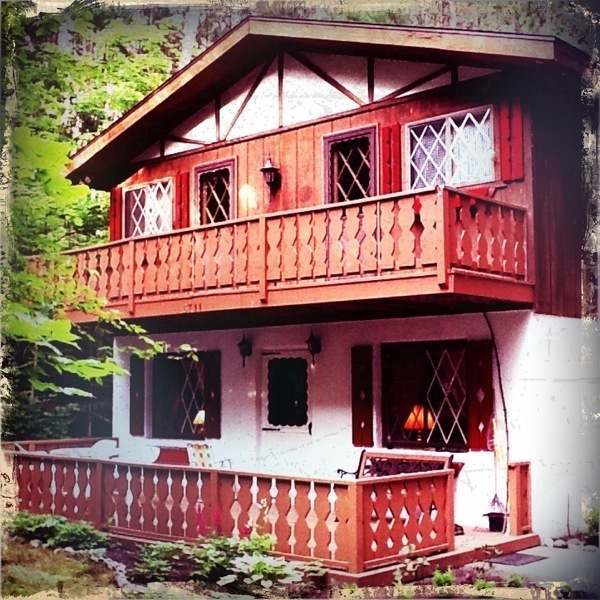 She and her husband live in Switzerland most of the year, spending Michigan's warm months in their cozy wooded chalet. She sent me a wonderful package from Switzerland this past winter filled with vintage silk threads and ribbons from an old nunnery. 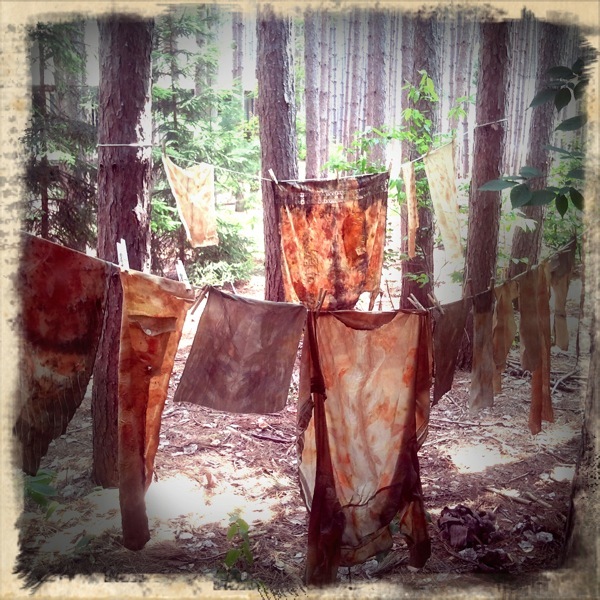 This was our second summer meeting for a dye party on Shuss mountain. Her hostess skills were shining with organic home cooked meals, including homemade pizza, mojitos and deertracks ice cream. Janet and Andre have traveled the world and it makes for great stories and unique conversations. 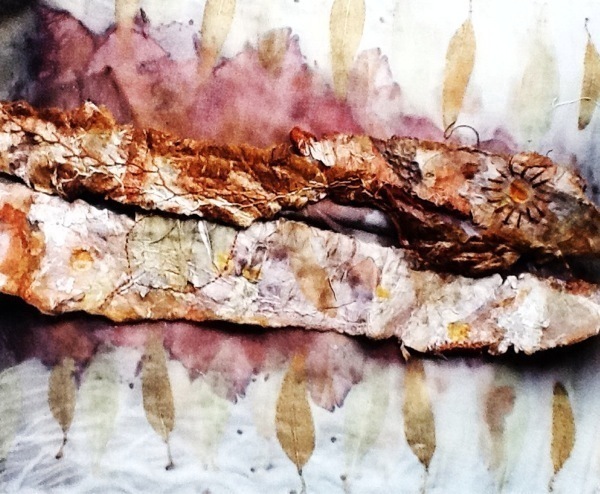 We ate, talked, felted and dyed. A perfect way to spend the weekend catching up. Then it was off to the rolling land of cherry orchards, arty, hip small towns and beautiful beaches with woodland forests knitting the vibrancy into this magical place called Sleeping Bear Dunes. It is known as one of North America's most sacred places, old trough it's Native American legend. It is one of my favorite places on earth, especially to walk in the woods. This year I came face to face with a doe and a velvet buck. On that same hike I was mesmerized by these blooming fairy- esque globes that were dappled along the forest floor. In this small northwestern corner of Michigan I am always surprised by the abundance of friendly, progress people, farmers markets and the peaceful feelings this place emotes for me. It just feels like home to a Californian Nature girl with Michigan midwestern roots. Close enough to get to hip Traverse City, Along M22 Glenn Arbor, Leland and North Port are my favorite haunts for good food and local artist supported shops. It's my third year in a row stealing precious moments in these towns, their beautiful lakes and beaches and my most favorite; Sleeping Bear Dunes National forest. Ummmm....what a perfect way to celebrate summer! Posted on July 19, 2011 by Michelle Hoffee.